TruScreen is a portable system used to directly identify cancer or pre-cancerous cells in cervical tissue. The system uses low levels of electricity and light to examine the cervix as a hand-held wand is gently moved over the surface of the cervix. Unlike the Pap test, tissue samples are not collected, which minimizes discomfort, and therefore the patient is more likely to return for a repeat screen. TruScreen has been extensively evaluated in studies involving thousands of women worldwide, and it has been shown to detect cervical cancer and its precursors just as frequently as a top quality conventional Pap test. As well as high accuracy, TruScreen provides an instant report, thus preventing the risk of losing contact with the patient because of the delay associated with transportation of samples to laboratories for analysis and reporting. TruScreen is an objective, self-checking digital system that can be used with minimal training of medical or paramedical staff, and without the infrastructure and resource costs associated with cytology-based screening. As with other screening techniques, acute infection must be treated before screening. TruScreen is the only objective, immediate optical-electrical test currently available. 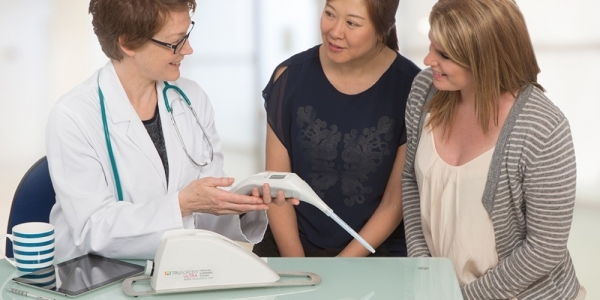 TruScreen has been shown to be more acceptable to women than a Pap test. Women strongly prefer being given an immediate result. TruScreen is a cost-effective test that can be used outside the established laboratory infrastructure and has high potential to aid in reducing cervical cancer mortality. TruScreen has been proven more acceptable to women than a conventional Pap test. A comparative study between the use of TruScreen and the conventional Pap test at the Whittington Hospital in London showed that TruScreen was associated with significantly less pain, pressure and scraping than experienced with the spatula or brushes used to collect cells from the cervix in cytology based screening. Women also strongly preferred access to an immediate result.